Of the 20 jetbikes I need for my two 10-man squads, I've got 18 finished and the last two are "on my workbench" as the saying goes these days. A full count leaves 6 more Warlocks, 3 more Vypers and a Farseer to finish. As soon as I can get these last two guys finished, I would like to get them all lined up and snap a few pics of what I have finished right now... so look for those to come soon. Hey Ron nice to see you are still working on these I was afraid we lost you to the Deathwing. I would reallly love to see some group shots of the army so far. And how is that Warlock of yours doing? dit you figure out what you are going to do with them? I found out that having a blog is extremely motivating! 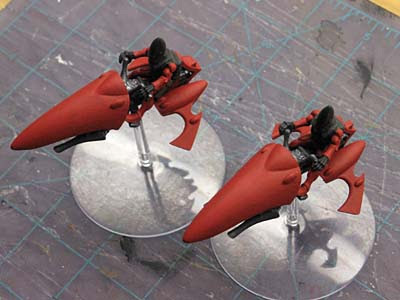 spend last night gluing and assembling 10 Jetbikes in 1 sitting was fun and very cool to see them all finished. It's great to see your warhost coming along quite nicely! Can't wait to see your whole army completed for the family picture! Thanks guys, I have all of them lined up off on the side of my workbench... as motivation. The Warlock though, I've done nothing to yet. I'm waiting for divine inspiration to strike. As for the family pics, maybe as soon as this weekend. Great work. Congrats on getting so far. My own project is going rather slow at the moment because I keep getting distracted by the internet and my blog (ironically). Can't wait to see the whole army. Way to burn through those models, Ron! Keep it up! I need to line up my unfinished stuff on my table so they can keep me motivated. All those gray un-painted eyes... staring at me... judging me. Must paint!